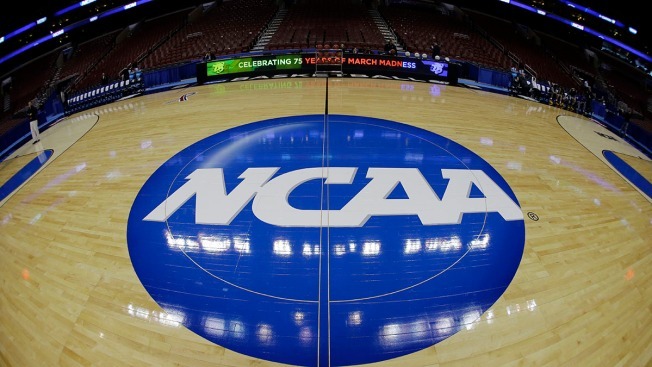 In this March 21, 2013, file photo, taken with a fisheye lens, the NCAA logo is displayed on the court during the NCAA college basketball tournament in Philadelphia. Big time college basketball was portrayed at the opening of a criminal trial Tuesday as a world where major schools and their heralded coaches count on athletic gear giants to funnel cash to struggling families of top-tier high school athletes to guide them to their doorstep. Assistant U.S. Attorney Eli Mark repeatedly said the schools are victims and urged a Manhattan federal court jury to convict an Adidas executive and two other men of fraud charges, saying their lies put multiple schools at risk of NCAA sanctions and the loss of millions of dollars. Defense lawyers, though, placed the blame largely on the schools' lust for basketball glory, saying blue-chip athletes were used to attract tens of millions of dollars in donations and revenues. Mark began his opening statement by describing how $20,000 in cash provided by former Adidas executive James Gatto was stuffed in an envelope and handed to the father of a highly sought-after high school prospect from Michigan, Brian Bowen Jr., at a meeting last year in a New Jersey parking lot. It was a down payment in a scheme to get Bowen to attend Louisville, an Adidas-sponsored program, that could launch him to the NBA, where aspiring agent Christian Dawkins could represent him, Mark said. When the payment to the Bowen family was uncovered, Louisville pulled his scholarship and fired its legendary coach, Rick Pitino. "This is what corruption in college basketball looks like," the prosecutor told the jury. Prosecutors say recordings from wiretaps and testimony of cooperators will show that Gatto, Dawkins and Adidas consultant Merl Code were behind similar payoffs to players sought by Kansas and North Carolina State that sometimes involved bidding wars with Nike, Mark said. All three men have pleaded not guilty to conspiracy and fraud charges. Their lawyers challenged the theory that the college programs were defrauded because of the defendants' lies. Gatto's attorney, Casey Donnelly, argued major college basketball programs were complicit because they stood to make so much money themselves. Donnelly said her client had no intention to harm Louisville because steering top athletes to schools was a "win, win, win," good for the school, good for Adidas and good for the athlete. The lawyer said Gatto was driven by the knowledge that some schools sponsored by Adidas would do almost anything to build "a nationally renowned basketball program, one that has the entire campus cheering." "A successful basketball program is the equivalent of a winning lottery ticket," she said, noting that Louisville's program generated nearly $40 million in 2017 while Pitino earned $7 million, more than he had made coaching in the NBA. The NCAA, she said, made $1 billion. Yet, she told jurors, "kids on court are not allowed to earn a dime." Lawyers for Gatto and Code acknowledged that their clients broke NCAA rules by steering cash to prospective college stars. Attorney Steven Haney Sr., representing Dawkins, said his client had known Bowen many years, considered him a younger brother, and believed any financial help fell under an NCAA exemption permitting help to be given by anyone with a pre-existing relationship with the athlete. Attorney Mark Moore, representing Code, said his client worked at Nike 14 years before setting off on his own with various clients, including Adidas. He said Code knew all about the so-called "shoe wars" between shoemakers seeking to sponsor schools and athletes. Moore said elite coaches counted on shoe companies to provide money, almost always cash, to the families of top recruits. "Nobody was dumb enough to do this in the open and wave it in front of the NCAA," he said.